Having looked at NASA’s place in the federal budget, I want to focus now on the role of space science generally and planetary science specifically at NASA. How does space science fit into NASA’s goals, and how has that changed since the agency’s formation? What are the effects of placing a high priority on planetary exploration (or not, as the case may be)? When Congress and the Eisenhower Administration first established NASA with the National Aeronautics and Space Act of 1958, they provided the new agency with eight separate objectives. I think it is very important to note that the first objective listed states that NASA will contribute to, “[t]he expansion of human knowledge of phenomena in the atmosphere and space.” To my mind, this places science at the top of NASA’s list of priorities. One of the clearest indications of an organization’s priorities is the level to which they fund their programs. So, looking at changes in funding levels serves as a good indicator of changing priorities. Adjusted for inflation to 2013 dollars. Amounts are in millions. The two major peaks are related to the Apollo program and building a new shuttle after the Challenger disaster. 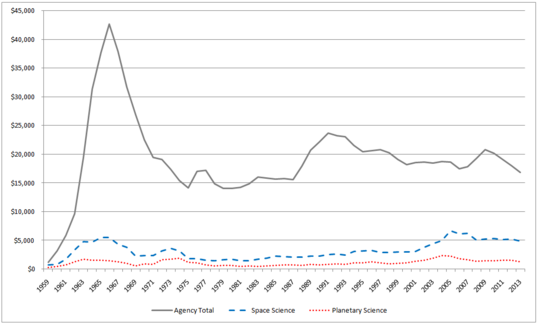 The above plot shows NASA’s top-level funding over the last five decades. 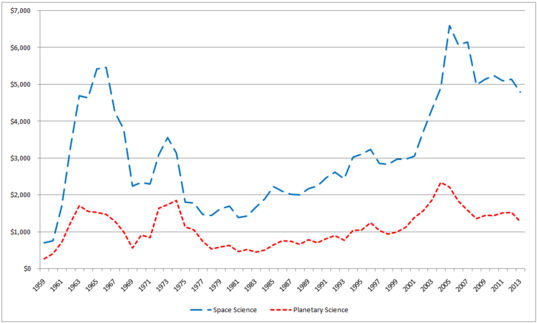 The most apparent feature of Figure I is the spike in NASA’s funding during the 1960s, which coincides with the race to the Moon. The Moon race was not simply NASA’s top priority, it was a national priority, which is precisely what accounts for the massive investment. Notice that the funds for the Moon race peaked in 1966, three years before the Apollo 11 landing. 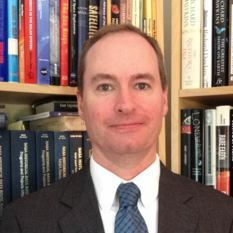 One major feature of large aerospace budgets is that development costs are far higher than operations costs, so the effects budget increases or reductions aren’t usually evident to outside observers for a few years. It can take a team of hundreds or even thousands of people years to build a spacecraft, but once it has launched, a crew of a few dozen people can often operate it. One of the dangers for the sustainability of NASA programs is the perception that, when the agency’s budget is reduced, things seem to still be going well for a few years, since projects in development are given priority over starting new projects. Today's missions were paid for by previous years' budgets. Today’s budgets are paying for tomorrow’s missions. Cuts now irreparably hurt the future of exploration. 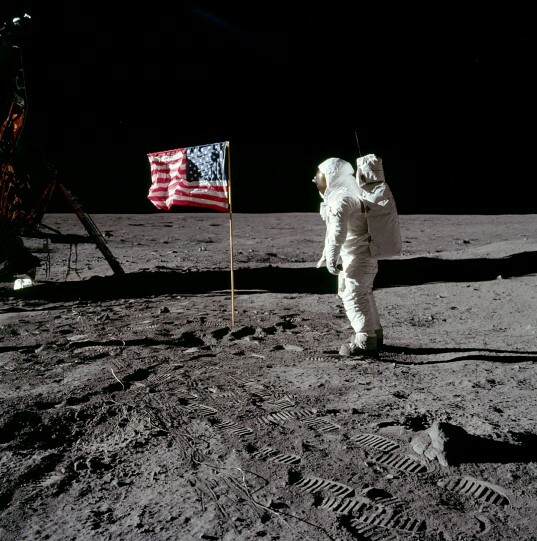 The Apollo program was a national priority, and NASA's budget reflected that during the 1960s. No other period, save for a temporary boost in the 1980s, has seen such strong investment. 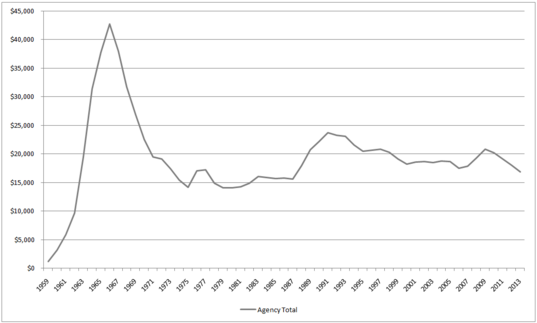 The other major increase in NASA’s total budget occurred in the late 1980s, following the Challenger disaster. This was a national tragedy, and building a new shuttle became a national priority, not just a NASA priority. These two anomalous instances (the Moon race and rebuilding after the loss of Challenger) notwithstanding, NASA’s budget has remained fairly steady over the years, bounded between $13 billion and $20 billion per year. Granted, there is a huge difference between those sums, but they seem to be the rough boundaries of federal investment in NASA, barring circumstances outside of the agency’s control. As a testament to the unusual nature of these two events, we should note that the budget following the Columbia tragedy in 2003 did not increase as dramatically as it did after Challenger. Congress and the White House did not view construction of a replacement shuttle as a national priority, nor did they invest at a commensurate rate to replace the shuttle program (leading, eventually, to the cancellation of the Constellation program, which is another story). Is Space Science a Priority? Amounts are in millions of dollars. Adjusted for inflation to 2013. Here we see NASA’s top-level funding over the last five decades in grey, with space science funding in blue. So, the space between the grey and blue lines covers all of NASA’s activities outside of space science, including aeronautics research (the first A in NASA), technology development, education, center and agency management, construction, maintenance, and the entire human spaceflight program. The total space science budget has rarely exceeded $5 billion, and has averaged just over half that amount. Remember that space science is more than just planetary: astrophysics, heliophysics, and Earth science are all funded in this number. Despite this, space science accounts for an average of 17 percent of NASA’s total budget, though it has significant fluctuations. 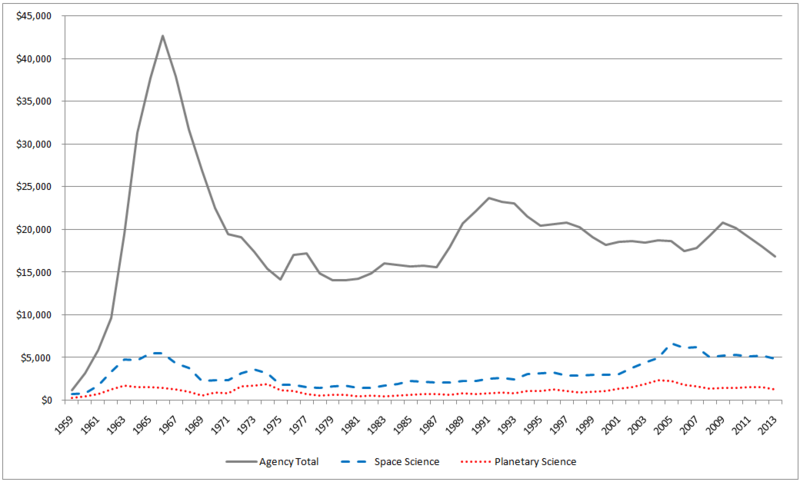 In the 1980s, space science was a mere 11 ½ percent of NASA’s budget, but in the 2000s, it made up 27 percent. 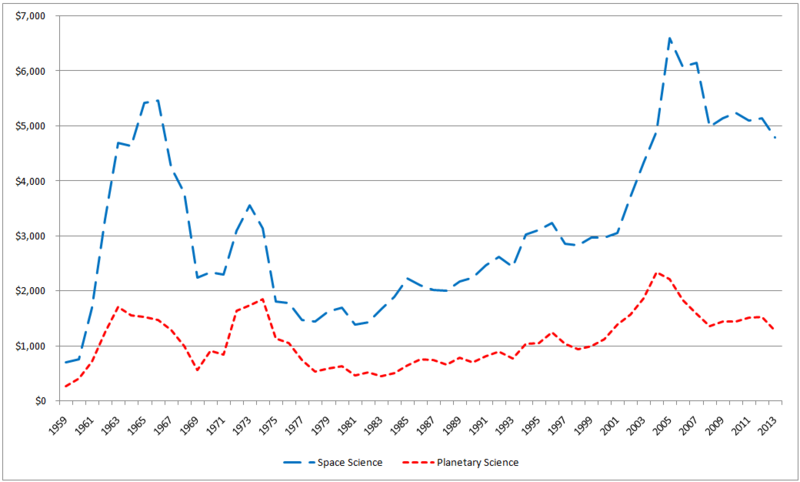 As a quick glance at the above plot shows us, space science has not always been a priority at NASA, but it has certainly gained traction in the last decade. In NASA’s first decade, many space science efforts were attached to the human spaceflight program, primarily in trying to determine the nature of the space environment to aid in future human missions, and then flying robotic lunar missions to test technologies and map the Moon. Despite the focus on the Moon program, NASA scientists and engineers also began developing the earliest planetary missions with the Mariner program. From 1960 to 1969, planetary science made up 32 percent of the space science budget, but only five percent of NASA’s total budget. Amounts are in millions of dollars. Adjusted for inflation to 2013 dollars. The dip in the 1980s represents the lost decade of planetary exploration. As the Apollo program came to a close in the 1970s, many space scientists felt that NASA could finally get back to its primary purpose—scientific exploration—and they argued vigorously for a stronger science program. As we can see, their argument prevailed for a time. Planetary science became the dominant portion of the space science budget, and from 1970 to 1979, planetary science accounted for nearly 50 percent of the space science budget, but still only six percent of the total NASA budget. In this decade, NASA launched the Viking mission to Mars and the Pioneer and Voyager missions to the outer planets (and beyond). 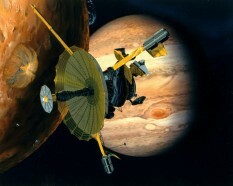 Galileo was the primary planetary mission throughout the 1980s and survived multiple attempts at cancellation. The 1980s brought about an existential crisis for U.S. planetary exploration. 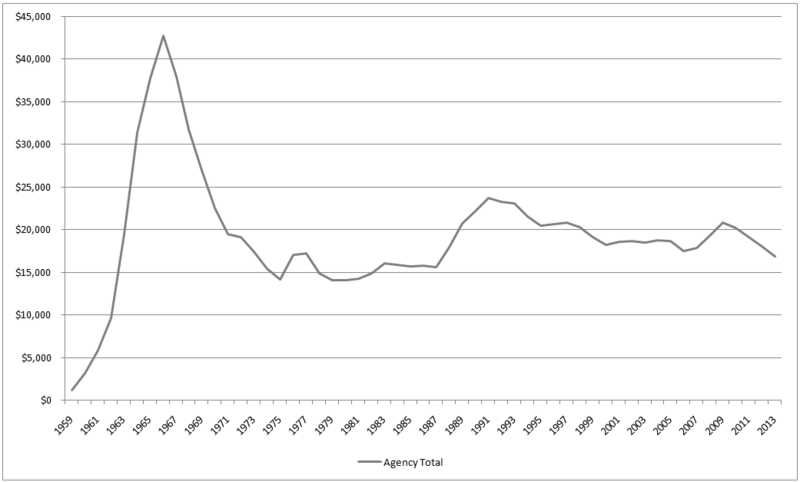 As we see above, NASA’s planetary science budget was cut to the bone and the entire enterprise was nearly abandoned. NASA was able to develop and launch the Galileo spacecraft in the 1980s, demonstrating that large projects may be viable even at historically low funding levels, but Galileo faced a tremendous amount of budgetary adversity. And like a snake that swallowed a goat, the planetary science community had to wait for Galileo to pass through before new missions could begin. In fact, NASA launched only one other planetary science mission in the 1980s (Magellan), resulting in a “lost decade” of planetary exploration. The volume of talent and capability abandoned to attrition during this time is difficult to measure. Planetary science made up 32 percent of a depleted space science budget in this lost decade, but just three percent of a historically low NASA budget, reflecting the priority NASA leadership and lawmakers placed on scientific exploration of the solar system. While many have referred to the ‘60s and ‘70s as the “Golden Age” of planetary exploration, I think a case could be made that the real golden age began in the first decade of this century. Looking again at the plot above, we see that NASA’s planetary science budget hit its highest level historically in 2005, and the list of successful missions since then is impressive. A fleet of spacecraft went to Mars to orbit, land, and rove on the planet, providing an unparalleled scientific return. MESSENGER became the first spacecraft to orbit Mercury, and New Horizons, launched in 2006, will arrive at Pluto next year, the first spacecraft to visit the dwarf planet. From 2000 to 2009, NASA’s Planetary Science Division received 34 percent of the agency’s increasing space science budget and nine percent of NASA’s total budget. So clearly, prioritization (as demonstrated by funding) has real consequences. And more, there seems to be a floor to the level of funding we can allocate to planetary science and still maintain a viable program (the early 1980s). By contrast, we have seen the effects of a moderate prioritization (the 1990s) and a higher prioritization (the mid-2000s). In my next post I hope to dig a bit deeper into just what we get for our investment in planetary science. The sad fact is, is that there's nowhere new to go. Ceres and Pluto next year are it. Orion and the asteroid catcher thing are just expensive stunts which have little scientific value. If we're going to go BACK to the Moon, then let's do it. There was a manned flyby of Mars, proposed, which would test if we can physically make the journey there and back, but that seems to be little more than a pipedream. Mercury is extremely hard to get to, Venus is almost unlandable, Europa seems doable, but that's in the outer solar system and with no plutonium, how the heck are we going to get there or beyond? People got bored with Cassini, which is still taking pictures at Saturn, MESSENGER barely made any news even when it got there for the first time. That leaves Mars, but we've already got a dozen or so spacecraft orbiting or driving on the surface. Aside from Curiosity, what about the others? No one cares except for some fans and the scientists working on the projects. The WOW factor is gone. Lord knows I WANT a Europa mission, the search for extraterrestrial life is the most important thing in planetary science and always was, but there's no FIRSTS anymore to discover besides that. Nobody wants to go to Pallas or Juno, Nobody's going to want to see Jupiter's outer moons close up. Maybe they do, but they're not going to fork over a dime for it. Face it, there's nowhere left to go. There's plenty of "WOW" left to be had in our solar system, not that that should be the deciding factor in whether science gets done. We've never landed on any of the moons of the gas giants. A giant Jupiter rising over the frozen landscape of Ganymede would be an incredible sight. We don't have any pictures from the inside of the atmosphere of a gas giant. The Uranus and Neptune systems remain badly underexplored. Just because Voyager 2 has already given us glimpses of these worlds doesn't make the what flagship class orbiters could show us less exciting, if anything, it's the opposite. Views of Titan's surface including the methane lakes from a low flying balloon would be amazing. For dramatic first encounters, there are still missions to Eris and Sedna. NASA should have a "Mars moratorium" for a while after the 2020 mission. Concentrate on Venus or Europa, or send a mission to Uranus and Neptune. First we gotta make more plutonium (can they make a thorium reactor that small? There's vast amounts of thorium out there), because that's the only way we're going to get to the outer solar system. Second, and I know I'm repeating myself, the next time NASA requests ideas for missions, NO MARS!!!!! My bad. Ganymede is tidally locked, so that giant Jupiter wouldn't be "rising over the frozen landscape of Ganymede", just hanging. Unless we send rovers.